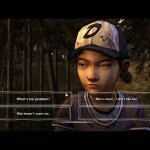 Since its release The Walking dead series has been nothing but an emotional train wreck waiting to happened, and in Telltale first game we followed the story of Clementine and Lee as they tried to survive, and we all fell in love with Clementine as she endured the harsh world they now live in. We became emotionally attach to her and want to see her pull through despite having nothing to hold on too. 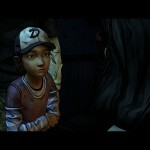 In season 2 Clementine is a bit older and much more aware of how the world is and how fragile life can be. 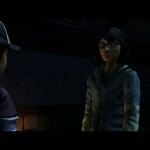 Writers Nick Breckon and Andrew Grant do an exceptional job with Clementine’s growth from season 1, we see early on that Clementine is not the scared little girl anymore; in fact we see more of her toughness and ability to endure throughout the game, But for most part Clementine is an outsider and is treated as such. 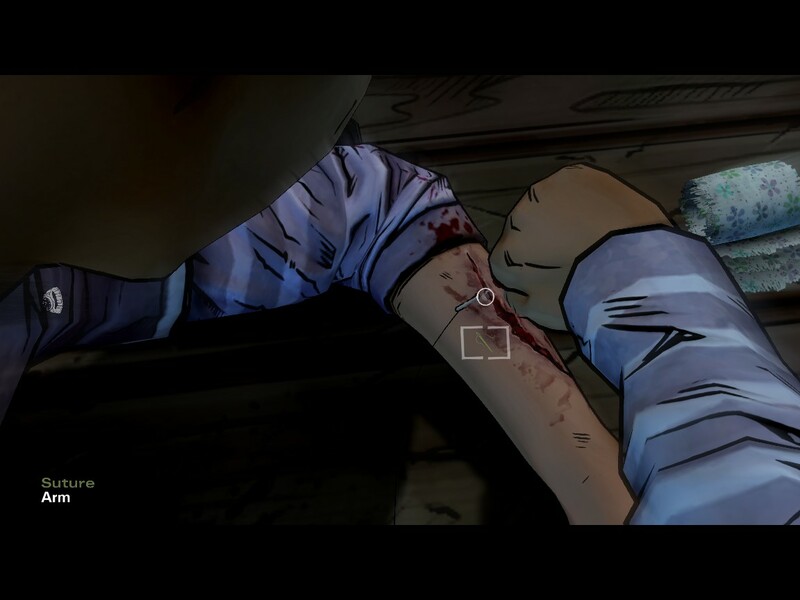 The main focus in “All That Remains” is the new group of survivors Clementine comes across, A cautious and protective group who at first nothing to do with her, but as you play along they slow open up to her. There are plenty of encounters in the game with choices and conversations that will surely play out in the future, so make sure you play close attention to every conversation you have with certain characters. 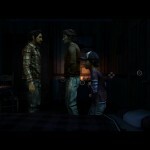 Like I said before Clementine is an outsider so many of the groups members aren’t shy about showing there disapproval of her being around, At one point a wound Clementine is told to sleep inside a shed without given any medical attention and players must sneak in sneak inside the house for medical supplies so she can patch it up; As for the characters in the group none of them really play a huge role on the story for the most part, or at least now they don’t. But there some interesting conversations with characters like Pete his nephew Nick and Rebecca who seems to be hiding something. You can argue that the story moves a little too quickly which hampers us from getting to know more about the other characters, We do get some info about certain characters, one being Carlos and his strange daughter Sarah. 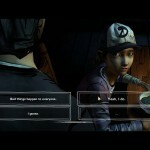 Developers Telltale Games kept the controls pretty much the same as the last game; players do a lot of quick time/ Time Base events, also dialogue trees that gives you a limited time to choose. Combat isn’t a priority in these games, so if this is your first time playing this game be aware of what I just said, The Writing is what makes this game the success that it is, and with that said Telltale games nailed it again with this opening episode, this series of episodes are sure to be interesting and more exciting than the last,This is a most get for fans of the franchise. 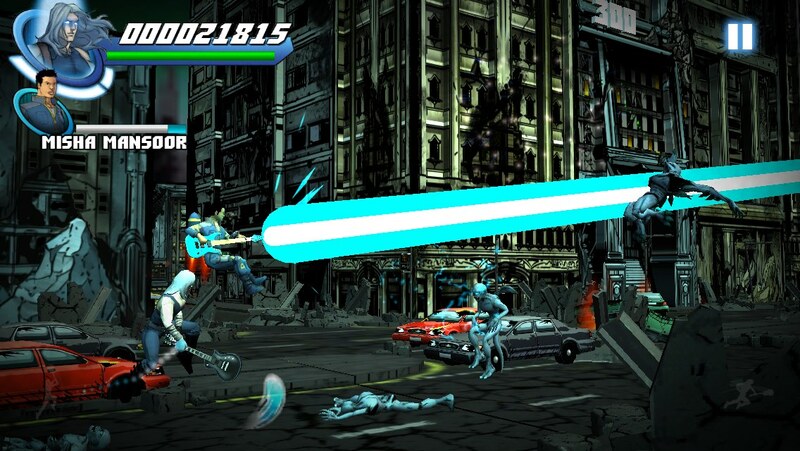 Based On IDW Publishing’s Cult Comic Series And Featuring Real-World Rock Star Cameos, The 3D Scrolling Endless Brawler Is Out Now For iPad, iPhone And iPod Touch. 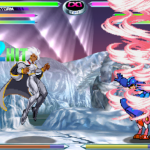 The brainchild of British guitarist and comic creator Llexi Leon, The multi-media Eternal Descent phenomenon has finally been unleashed on the world of video games. Developed by London-based PLA Studios, the action-packed, 3D scrolling endless brawler Eternal Descent: Heavy Metal Heroes is now available on the App Store for iPad, iPhone and iPod Touch*.Based on IDW Publishing’s cult comic book series, Eternal Descent: Heavy Metal Heroesplaces gamers in the role of Sirian, a nomadic warrior fighting back endless hordes of demonic creatures as they rampage through the city streets. Armed with a supernaturally charged electric guitar, Sirian must traverse the depths of the underworld and eliminate the Pit Lords within – all to a killer soundtrack.Eternal Descent: Heavy Metal Heroes also features appearances and original performances from Joe Satriani, Misha Mansoor (Periphery) and Andrew W.K. 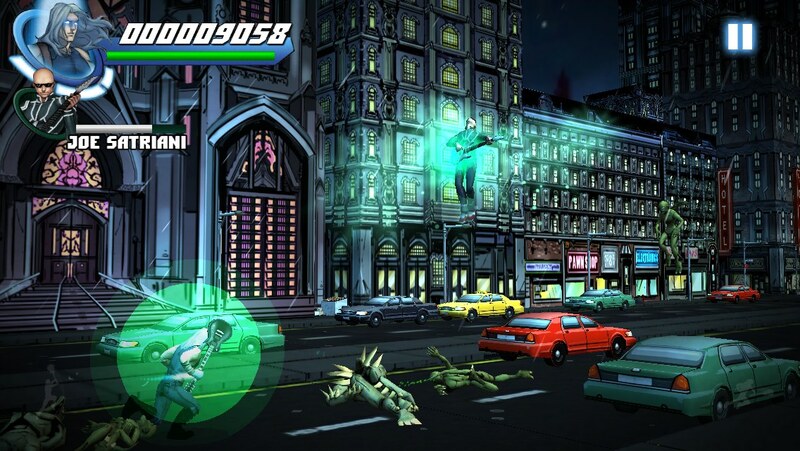 who act as heroic tag-team assists activated by power-up tokens within the game. Wayne Static and Michael Amott (Arch Enemy) take on the role of end of area boss characters, gatekeepers to the realms on Sirian’s journey to Hell. 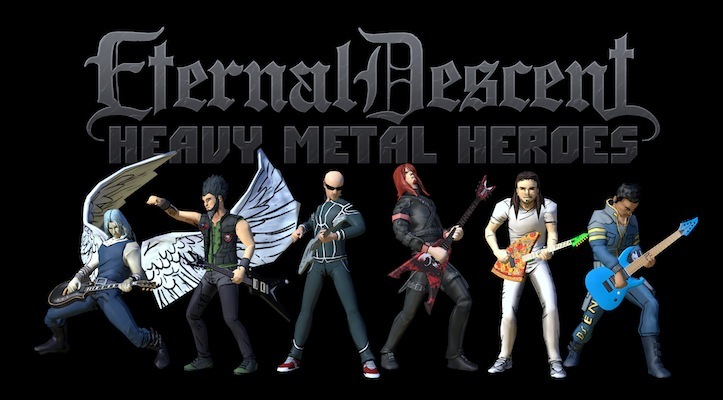 With more rock/metal music acts slated to appear in future updates for Eternal Descent: Heavy Metal Heroes, instrument brands such as ESP, Jackson and Dean Guitars have leant their support to ensure that all cameo musicians appear with their signature instruments for real shred guitar action! 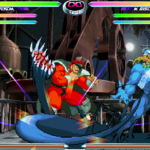 A series of updates with new characters and additional content are planned for release throughout 2014. 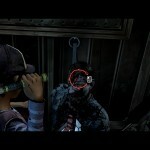 Don’t want to wait for The Walking Dead Season Three premiere this Sunday night to get your zombie fix? Then make sure you take advantage of THE WALKING DEAD HALF-OFF SALE. This pre-premiere event brings together Robert Kirkman, creator and writer of The Walking Dead and writer/Executive Producer of the hit AMC TV show based upon his groundbreaking comic series and bestselling graphic novels; Skybound, his imprint at Image Comics; and comiXology to offer a well-timed sale this weekend from Friday, October 12th to Monday October 15th on the original, comic series that inspired the show, the novels, the games and the entire universe of The Walking Dead. Now is your chance to read the original The Walking Dead ongoing comic book series. 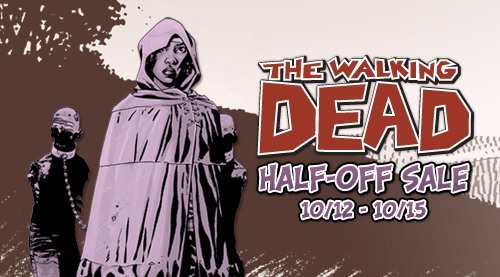 All the issues of The Walking Dead will be .99 cents, and Volume 1 through Volume 16, collecting the first 96 issues of the series will be half-off! Where else can you get this level of entertainment for under a buck? Based on one of the most successful and popular comic books of all time, written and created by Robert Kirkman, The Walking Dead captures the ongoing human drama following a zombie apocalypse. 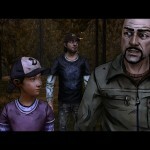 The series follows a group of survivors, led by sheriff Rick Grimes, in search of a safe and secure home. However, instead of the zombies, it is the living who remain that truly become the walking dead. 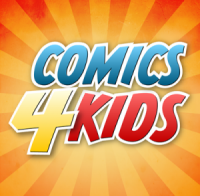 ComiXology’s Comics4Kids iOS App Debuting New “Parent-Friendly Sync” Feature! Starting today, it’s easier than ever before to share your love of comics with your kids via comiXology’s newly upgraded Comics4Kids iOS app featuring “parent-friendly sync” among other major upgrades. Parents that have an existing account on comiXology – the revolutionary digital comics platform available across iPhone, iPad, Android, Kindle Fire, Windows 8 and the Web – will find that only their kid friendly content syncs when they log in to the Comics4Kids app. In addition to “parent-friendly sync”, the new 3.1 version of the Comics4Kids app features better discoverability, CMX-HD capability and an amazing arrary of kid friendly content like Adventure Time, Archie, Garfield, Nancy Drew, Smurfs, Peanuts, Sabrina, Sonic, Simpsons Comics, Young Justice, and many, many more. Major publishers represented include such luminaries as ABRAMS ComicArts , Archaia Archie, Bongo, BOOM! Studios, Cartoon Books, DC, Dynamite, IDW, Image Comics, MonkeyBrain, NBM, Oni Press, Papercutz Red 5, Studio 407, Teshkeel, Th3rd World Studios, Titan, Top Shelf, and Zenescope. In addition to the unique “parent-friendly sync” feature, the Comics4Kids iOS app upgrade brings the app into to parity with the rest of the comiXology family of apps, delivering the same great shopping and reading experience that comiXology is known for. Users of the older version will find that the Comics4Kids3.1 iOS app sports a sleek, new design and interface that enhances overall stability and usability. The advanced UI enables a near instantaneous launch dramatically cutting down the app’s load times, allowing kids to easily find new content and start reading faster than ever before. In addition to the overall re-design, the app now has new discoverability options, enhanced feature spotlights, more categories for new content, series and storyline listings, and CMX-HD resolution books for users of the new iPad. To help better organize downloaded comics and graphic novels, “Purchases” now has its own tab so users can always find their comics for quick and easy download without cluttering their “My Comics” area. Previous users of the Comics4Kids app will be happy to know that while vast improvements have been made, the Comics4Kids app continues to deliver the high quality comic reading experience customers have come to expect from comiXology powered apps through the use of it’s patent-pending Guided View™ Technology; that includes a wide variety of reading options and settings, enabling users to set the speed of transitions in addition to page orientations and much more. ◦ Easily read comics from anywhere in the store. Posted on October 12, 2012 Author Anthony DavisCategories Comics, Press ReleaseTags Android, Comics4Kids, comixology, Digital Comics, ipad, iphone, kindle fire, Windows 8Leave a comment on ComiXology’s Comics4Kids iOS App Debuting New “Parent-Friendly Sync” Feature! 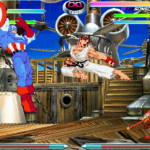 Marvel vs Capcom 2 arrives on iOS this month! 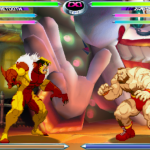 Older console ports to mobile are becoming a trend, Marvel vs Capcom 2 is joining that list on April 25, 2012 with full action for fighting fans. 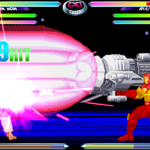 The game is set to pack the full 56 character roster that made the game a hit in arcades and on consoles for so many years. No word remains on online multiplayer options or even how the control scheme has been designed yet but its safe to say this might be best experienced on an iPad over a standard iPhone simply for real estate space on your screen. 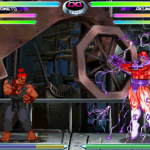 For those wondering, judging by the screens this is a port of the classic version of the game not the HD version found later on the Xbox, that should give some hints at how the mechanics will be balanced as well. Check out the gallery for more info and pick it up when it drops next week if you’re up for the challenge. 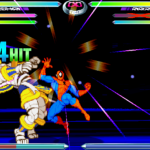 Posted on April 20, 2012 Author Gabriel VegaCategories Games, NewsTags capcom, Gaming, iOS, ipad, iphone, Marvel, marvel vs capcom 2, mvc2Leave a comment on Marvel vs Capcom 2 arrives on iOS this month! With the latest iPad hitting retail it’s no shocker that everyone is trying to update and make use of the new hardware, ComiXology is rolling out CMX HD to bring high-resolution content to the new iPad for a select group of titles. Expansion will be inevitable and the company notes they’re already working on updating their catalog to the new standards hoping that HD plays a large part in their next milestone of purchases and sharing between comic fans. In addition to the upgraded goodness of crisp art, CMX HD will also allow readers to share comics with friends on Facebook, Twitter and Email form to spread the word, it’s a unique way to keep friends updated on your tastes especially when the holidays come around and they go into panic mode. It’s also a solid way to turn those on the fence over to comics or more specifically digital comics through ComiXology. Here’s a full taste of the app log, enjoy and chase it down if you’re already holding on to an iPad HD. If not just continue enjoying your collection and know that your SD titles will be getting a nice boost in the future as well! Now featuring High Definition capable comics for the new iPad — with twice the resolution. Look for the CMX-HD badge in the store to find these HD comics and graphic novels. Finally, users also have the option of sharing comments via an individual’s Facebook wall or Timeline. 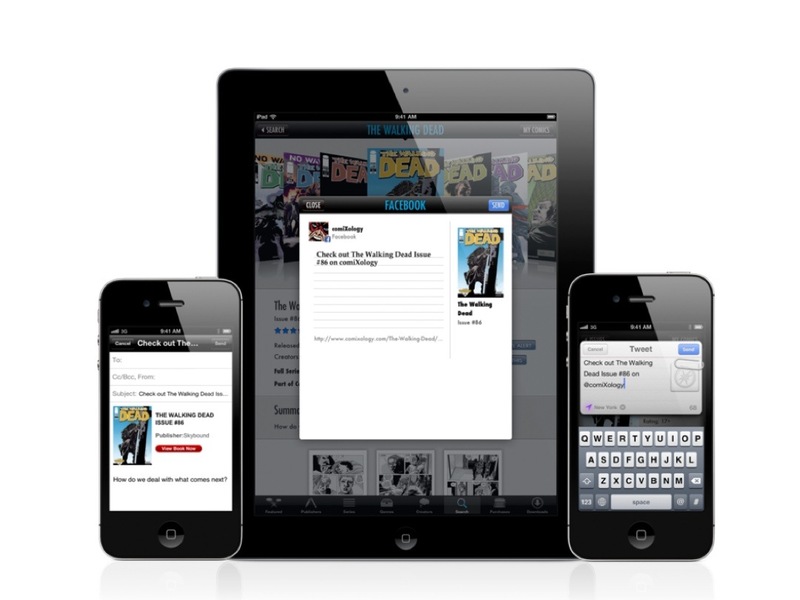 Comics now uses the new Twitter APIs on iOS 5 to enable social commenting on any Comic Book. Users also have the option of sharing via Email. The Email share view displays the iOS app email compose view, including an HTML formatted email. In all cases, including Twitter, if no network is available then the user will not see any share options. If an account is not yet set up for the chosen share method, then Comics will alert the user to setup that particular sharing account. 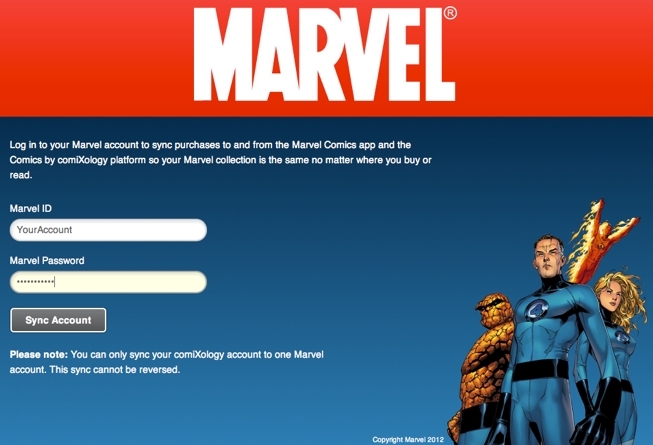 Immediately after purchasing a comic book that begins downloading, users will be presented with a “Read Now” button (replacing the former “Downloading” button). Now users can begin reading comic books without waiting for the entire download to complete. Additionally to the above feature enhancements we have made substantial improvements to bugs, crashes and stability in the Comics App. Love drawing on your iDevices? Ten One Design has a product update for you, today the company is launching their improved version of the Pogo Sketch series for iOS devices. Using the new Pro Tip technology they’re providing greater sensitivity while offering an even smaller tip, the result provides superior control and precision when working with it. For those in doubt go from trying to sketch something with a Crayola marker to using a ball point pen. It’s obviously not that exact of a size drop but any changes to have greater sense of place do help. For those that just want to keep the smudges off their screen, it also allows for quick navigation and typing on the go. For those that already own the original Pogo Sketch, Ten One Design is offering 50% off if you send a picture of your current stylus to their special email address. Although time is limited, the offer expires on January 31st at 11:59PM (EST) so you really don’t have that much time. As the picture indicates, you can find the Plus in Burnt Orange, Cactus, Hot Pink and Silver for $14.95 on their website. If there was word about these working with Android devices I’d be tempted to invest in one, I’m looking at offerings from Incipio so I can get a better experience on my HTC phone for Sketchbook. If you’re a digital comic fan you’ve no doubt heard about comiXology the comic reading app that allows you to read your favorite series anywhere you’re at. Today though they’ve worked with IDW to personalize the offering even more. Fans can now download direct apps for their favorite series on iTunes, given the support of comiXology to other platforms I wouldn’t put it out of consideration for Android users to get a similar option later. New and old purchases through comiXology will sync to the designated app allowing you seamless integration of your existing collection to these apps. On top of that, IDW will launch digital releases on the same day as their print releases to make sure that people will not have to wait to read their favorite series. Pricing will remain full cover price value though for new comics. No further comment is out about old releases. comiXology is really taking over the landscape, with options available on all major platforms and it being bundled with the Kindle Fire they’re taking the lead for ease of access to your favorite reads. I wouldn’t mind having a dedicated Doctor Who app or other specifics on my phone, hopefully they do something similar for Android in the future. 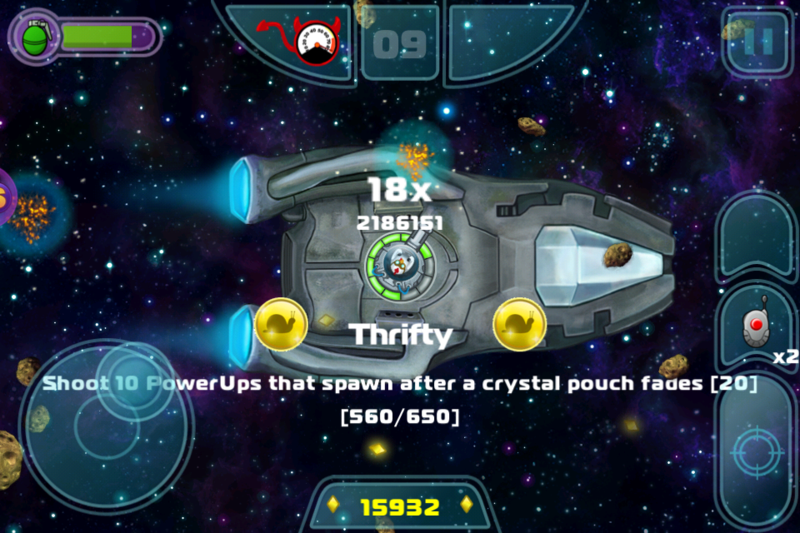 In our off time we had an email drop about Gunner Galaxies coming to the iOS products for cheap, while it’s not hard to imagine 99 cent games or $1.99 games we rarely see well developed new releases debut at free and in HD form as well. Check it out on the App Store and give it a whirl, afterall it’ll only cost you a bit of bandwidth or wifi time. 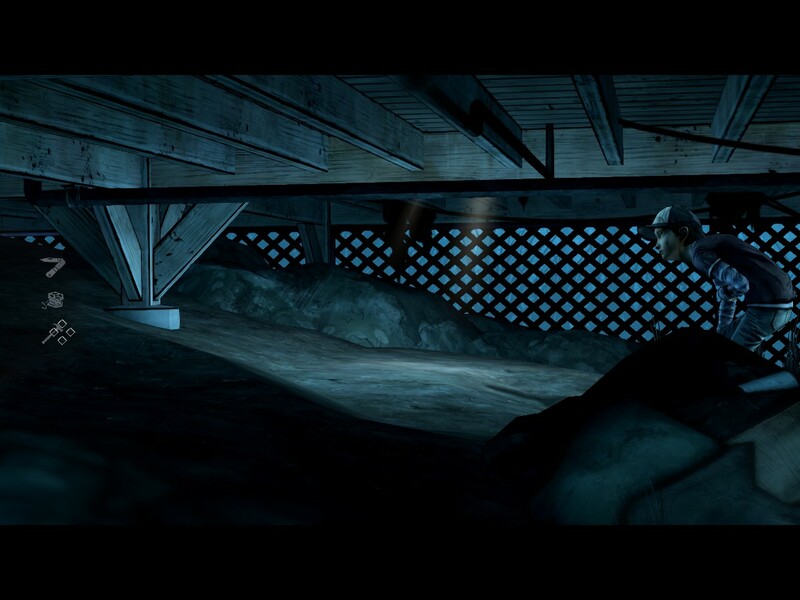 For those hoping to get more details, check out the mini gallery for some ideas of what madness you’re stepping into. For those that take the leap let us know what you think of the game in the comments as only one of us has an Apple device and I don’t see any Android love right now. Maybe we can get a word from Franks when he drops in today.